There are 17 key questions organizations should ask to help determine Next Generation ACO readiness. 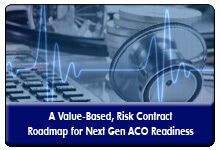 Although letters of intent for the next round of CMS’s Next Generation ACOs are due in just three weeks, accountable care organizations applying to this program are not committed to joining until December 2016, Healthcare Strategy Group reminded participants during Next Generation ACO: An Organizational Readiness Assessment, an April 2016 webinar now available for replay. Because the three-part NGACO applicationletter of intent, or LOI (now due May 20), the Next Generation ACO application (due May 25) and the participating provider list (due June 3)are all non-binding, Healthcare Strategy Group’s Travis Ansel, senior manager of strategic services, and Walter Hankwitz, senior accountable care advisor, encouraged organizations with any interest in CMS’s latest ACO model to submit these items to CMS while continuing to evaluate whether the Next Generation ACO program is right for them. In regards to the NGACO provider list, there are two important considerations, Hankwitz added. First, while non-binding, the provider list cannot be revised once submitted. Second, as the provider list pertains to the Physician Quality Reporting System (PQRS), if a participant’s name, be it a physician or an allied health professional, is not on the provider list submitted by June 3, that provider will not be eligible to be qualified for PQRS through the ACO the following year. In their comprehensive NGACO assessment, the pair walked through the five key elements of the model, including attribution, benchmarks, the risk/savings corridor, provider payments, and waivers and beneficiaries. “In evaluating the Next Generation ACO proposition, organizations need to ask themselves if they have the bandwidth to administer this new, complex, high-risk program,” advised Ansel. In addition, they proposed a list of 17 key NGACO assessment questions organizations should answer to help determine their readiness for participation. This checklist covers program prerequisites, performance and population health management, among other NGACO areas. There are currently 20 Next Generation ACOs, most of whom were Pioneer ACOs or Medicare Shared Savings Program (MSSP) participants, the consultants said. Are Multi-Specialty Physician Groups ‘Next Generation’ to Transition to ACOs? 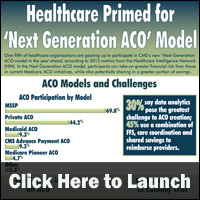 In another step towards advancing models of care that reward value over volume, HHS recently announced the Next Generation Accountable Care Organization (ACO) Model of payment and care delivery, a new initiative designed to move an increasing percentage of Medicare payments into models that support value-based care, and which supports a number of tools including telehealth and post-discharge home services. 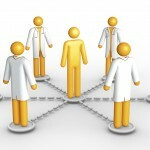 With their built-in cadre of healthcare providers, multi-specialty physician groups (referred to here as physician groups), which comprised about a tenth of survey respondents to the Healthcare Intelligence Network’s third annual Accountable Care Organization survey administered in 2013, would seem ideally placed to transition to accountable care organizations. Percentage-wise, this sector has the highest rate of existing ACOs (57 percent participating in ACOs versus 34 percent of overall respondents) and twice the rate of participants in the CMS Pioneer ACO program (25 percent versus 13 percent). Other characteristics of this sector follow. More than half of ACOs in this sector are administered by independent physician associations (IPAs), and most are smaller than the hospital-sized ACOs reported above, with three-quarters reporting a physician staff of less than 100. These ACOs benefit from having specialists on board in greater numbers to help with care coordination of the chronically ill (100 percent include specialists, versus 71 percent overall). Perhaps because their organizational structure lends itself to the ACO model, the majority of this sector75 percentneeded less than year to launch its accountable care organization (versus 29 percent of overall respondents, whose comfort level was between 18 months and two years). These ACOs seem to have all the clinical pieces in place, reporting near-unanimous usage of evidence-based care, case management, care transition management and population health management. They are also unanimous in the review of clinical outcomes as an ACO success measurement, and much more likely than their counterparts to consider provider satisfaction in program evaluation (50 percent of physician group-led ACOs, versus 32 percent of overall respondents). 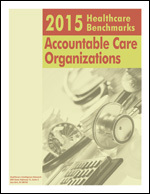 2013 Healthcare Benchmarks: Accountable Care Organizations documents the numerous ways in which accountable care is transforming healthcare delivery, particularly in the area of care coordination, where the ACO model has had the greatest impact for this year’s respondents. Posted in Accountable Care Organizations, Physician Practices, Physician-Hospital Organizations | Comments Off on Are Multi-Specialty Physician Groups ‘Next Generation’ to Transition to ACOs?